The Texas State Bobcats opened training camp to the public today as Coach Franchione and the Bobcats began the long, strenuous journey that is the 2014-’15 football season. The energy and buzz around the team was evident even as the Bobcat players began their warm ups. It’s clear they realize the expectations that have been placed upon them as they enter their second season of play in the Sun Belt Conference. 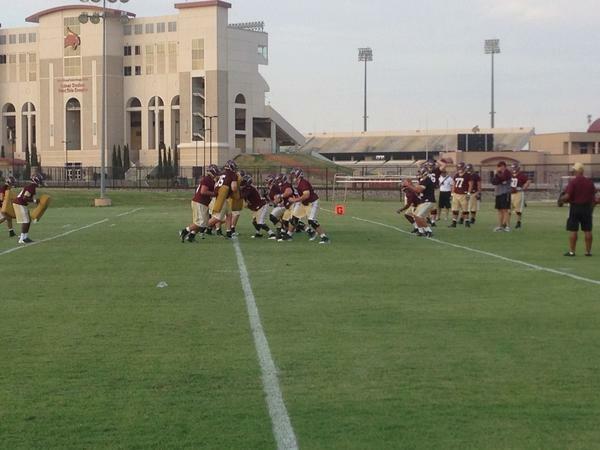 The Bobcats started practice off by dividing up into their respective positions. K Jason Dann looked very good from 30+ yards out while QB Tyler Jones and the offense worked on motion plays and fake hand offs across the field. The wide receivers gathered around the JUGS machine. Red-shirt freshman WR Brice Gunter would catch his first pass with ease and call out “turn it up”. However he would drop the pass his next time through, immediately hitting the ground for push-ups. This is a trend I would see throughout practice with any player who dropped the ball. Transfer WR Brennan Blakemore also looked very good on the machine, catching all his passes cleanly. The experience shows as he uses his hands well. He also showed a good ability to adjust to the ball in the air later in practice. The offense would then come together though OL Matt Freeman would leave with an apparent right ankle injury. He would however remain on the practice field. Gunter showed off his size and skill right away with a nice outside shoulder catch. I cannot stress enough how physically impressive Brice Gunter looks. And this is just in shorts and tees. Noticing quite a few twin wide receiver sets today. WR Ben Ijah dropped an easy pass laid in perfectly over his left shoulder but rebounded nicely with a shoestring catch on a low pass from Tyler Jones. Jones was noticeably off with a few of his passes today. It should be noted QB Fred Nixon started with the second team but it was QB Randy Price who showed some nice touch on passes while working on curl routes. Freshman WR Tyler Watts also caught my eye in drills showing an extremely nice up field burst on screen plays. Speaking of bursts, RB Chris Nutall is already looking game-day fast. His initial burst through the line is something to behold. The defense would go to work on the opposite field as the defensive line and linebackers would start out working on gap assignments. It’s also clear that quickness and hand placement are going to be stressed right away. DE Thomas Evans immediately separated himself as his quickness stood out above all the rest. He also looks to be in great physical shape and could be heard coaching up some of the younger linemen. LB Michael Orakpo also looked very good in drills. It’s clear he’s already focused in on this season. The defensive backs would go through a series of motion drills before combining with the wide receivers to do some 1 on 1 work. CB Andrew Aneke looked great in 1 on 1 with multiple pass break ups. He moves extremely well in coverage. CB David Farris would come down with an interception while working against Brice Gunter. Senior CB David Mims II would join him directly after with an INT of his own. But the 1 on 1 winner of the day was S Germod Williams. I’m not sure any receivers caught a ball on him during the drill and he made sure to let them know about it. His talk would continue as the Bobcats came together for some 11 on 11 to round out practice. The defense looked good but it was the offense that got the better of it on Day 1. Though still struggling on a few passes, Tyler Jones would find Brice Gunter on an out route that saw Gunter beat his man and take it to the house for six. Chris Nutall flashed his speed again, breaking off what would have been multiple runs of 10 yards or more. The defense looked out of place at times but the communication was there. Coach Thompson joins the Bobcats this year after spending two season with Arkansas State in the same capacity. Head Coach Dennis Franchione seemed pleased enough with the defense as well. In a change from last year, it’s the defense that’s playing catch up early while the offense is looking good. Only time will tell if both sides will be up to par.